Mai-Tec Drainage & Guttering Ltd are an established independent gutter cleaning company with many satisfied commercial and residential clients in Kent, Sussex, Surrey, Hampshire and London. Why choose Mai-Tec to clean your gutters? We are a professional, local, gutter gleaning company. All our staff are fully trained, CRB checked and carry ID cards. 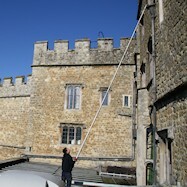 We use the latest cleaning equipment to give customers in the South East great service at a value for money price. 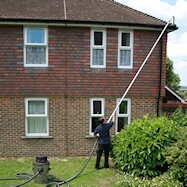 We provide gutter cleaning services for residential and commercial customers across Kent, East & West Sussex, Surrey, Hampshire, Berkshire and South London. 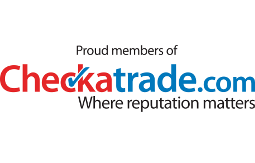 Each year there are over 3000 serious domestic accidents involving ladders. 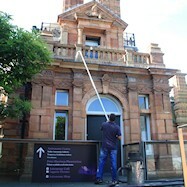 Don't risk serious injury or even your life cleaning gutters. Call the professionals to get the job done. 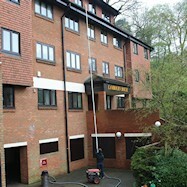 We provide gutter cleaning services for residential and commercial properties in the South East of England from a terraced house to shopping centres, office blocks & schools. Because we use the Gutter Vac System, we don't need expensive scaffolding and can therefore offer competitive prices for small and large gutter cleaning jobs. If you have any questions regarding gutter cleaning across the South East of England or for a FREE no obligation quote, call 01892 613 388 or email Mai-Tec Gutters today.